Muckertich Mellickneaz was the executor and son of Howan Emnias. 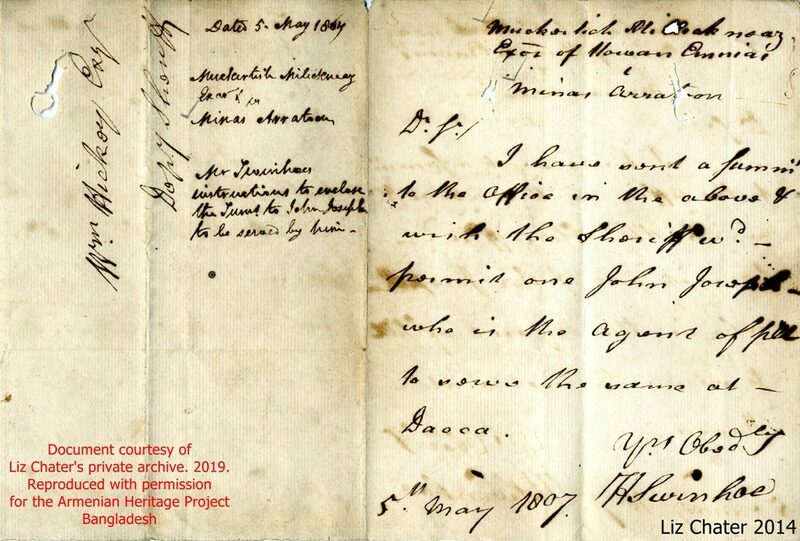 Swinhoe is preparing to serve papers on Minas Arratoon of Dacca in 1807. One of the graves at the Armenian Church in Dacca is that of Minas Arratoon. It is written in Armenian with a small inscription in English as well. In this grave lies the body of a certain pious person named Minas son of Harutiwan Kalantar,* whose family was from Jugha [New Julfa]. He came to India for a lawsuit, in the seventy fifth year of life he passed onto the Lord in one thousand eight hundred added to which twenty two [years], on the twenty second** day of the month of Dama, the day of the week [being] Sunday, and in the large city of Dacca. **The date presents a problem. 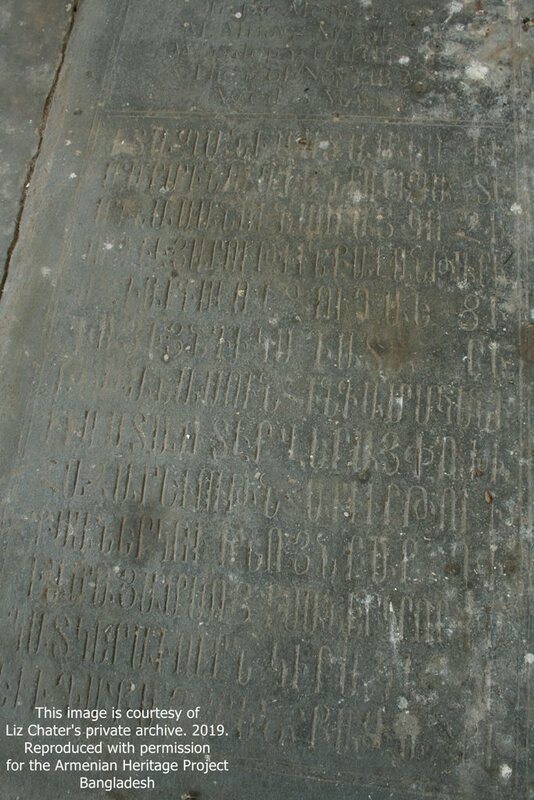 While the first part of the epitaph in English states that Minas died on November 17, 1822, the Armenian dates that event on Dama 22. The latter would correspond to November 7 according to Julian calendar. Converting that date to the Gregorian calendar would produce 19, not 17. There is obviously a mistake either in the Armenian or in the English. The day of the week, namely Sunday, written out in full in the Armenian section is helpful in solving the problem. The date in the English section is correct, since November 17, 1822 according to the Gregorian calendar falls on a Sunday. However Dama 22, 1822, the date according to the Julian calendar and given in the Armenian section, falls on a Tuesday. It seems that the engraver or the writer of the epitaph made a mistake by writing TWENTYSECOND instead of TWENTIETH OF DAMA. The difference in Armenian consists of two extra letters in order to convert twentieth to twentysecond: KSANERORD KSANER(KR)ORD. Dama 20th (Julian c.) corresponds to Nov. 5, 1822 (Julian c) and Nov. 17 (Gregorian c).